As I sit here with a precious baby sleeping on my chest and smell that wonderful new baby smell, I am so grateful for her arrival and for the circumstances of her birth for so many reasons. We found out we were expecting our fifth in the summer, and while it was a surprise, it was a welcome one. Since I’d had a successful v-bac with my last pregnancy, I was hopeful for another easy and complication free delivery. I decided to use the same group of nurse midwives who had delivered our last baby as they delivered in the hospital and were very v-bac friendly. Overall, it was by far my easiest pregnancy! I avoided morning sickness entirely, which was a first for me and never really even had the first trimester fatigue I’d had in the past. Things were so easy in early pregnancy that I was glad to have my first appointment and hear the heartbeat to confirm that I was indeed pregnant! All early appointments showed that baby was healthy, growing well and that I was also doing well. With four other little ones running around and a busy schedule, the pregnancy flew by and before I knew it, I was 34 weeks! At my 34ish week appointment, the midwife commented that she thought the baby was breech but that there was still time for her to turn. I had suspected this since about 32 weeks. I literally did all of the suggested methods for turning a breech baby every single day from 34 weeks. A 35 week ultrasound confirmed that baby was still breech but that there was no obvious reason that they could see like cord around the neck, short cord, etc. I was still hopeful that she would turn, but I started to get a little worried by this point since the nurse midwives couldn’t deliver breech babies and the only option in that hospital was to attempt an External Cephalic Version (ECV) or do a c-section. An ECV would have to be done in the OR with an epidural since I was “once a v-bac, always a v-bac” and it carried risks like uterine rupture, placental abruption, fetal distress and other problems. I started researching options and statistics to see what my choices were. I realized that no option was without risk and that any choice I made carried a higher risk than a vertex delivery. 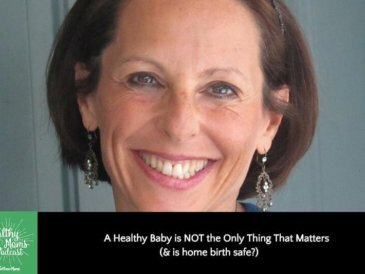 I found that in many other countries, vaginal breech birth still occurs and that when factors like fetal abnormality, uterine abnormality, etc are removed, vaginal breech birth carried about the same risk as breech birth by cesarean. I also took in to account that since I’d already had one c-section for placenta previa, a repeat c-section would carry a higher risk for me while not statistically reducing her risk. After discussing it, my husband and I weren’t comfortable with an ECV or a repeat c-section unless it was necessary (which we didn’t feel that it was at this point). Since vaginal breech birth wasn’t allowed in the hospital (thanks to insurance and legal policy, not the doctors and midwives) we decided to see if any other options were available. I had helped a friend find a home birth midwife earlier in my pregnancy and had gotten to meet her as well. After researching and talking to other moms she had worked with, I found that she was trained in breech birth and had a history of successful outcomes. I felt that we at least needed to look in to this option, but also felt a twinge of fear. 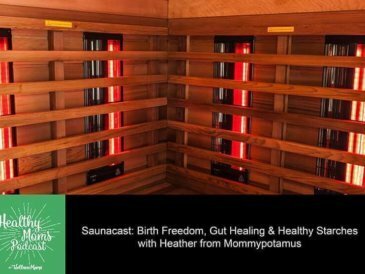 Logically, I knew that home birth can be statistically as safe as hospital birth in most cases and that statistically, it would be a good option for us, but after having undetected placenta previa with a previous pregnancy, I always held on to a fear that something might be wrong that we didn’t know about or that my body was somehow broken or inadequate. Even so, I decided to meet with the midwife again and after meeting with her and talking to my husband, I had peace about pursuing that option. I continued to try to get baby to flip and kept meeting with the hospital midwives to have a backup plan in case a c-section did become necessary. The several weeks leading up to my birth were mentally tough as I am not used to (or good at) not knowing how things will turn out or being able to direct things in some way. After much prayer and letting go, I came to terms with the fact that I wouldn’t necessarily know where or how this birth would happen until it did and just started trusting God and my body. We had a primary plan (vaginal delivery) and backup plans in place in case something went wrong (planned c-section or emergency transfer). Finally, at just over 39 weeks, I had on and off contractions all day that got my attention. They weren’t painful per se, but were intense enough that I wanted to move around through them. They came every 10 minutes or so all day that day. Through dinner my contractions were about 6 minutes apart and they started picking up as we drove home. We watched a movie and I noticed I was starting to get nauseous and that they were getting much less comfortable. As tends to happen, as soon as I attempted to sleep, the contractions picked up even more and were about five minutes apart and definitely uncomfortable. My contractions never get completely regular, even during transition (which really frustrates me…) but I knew at this point that it was the real thing. Based on previous labors, I expected another 20+ hours of labor, so I tried to just ignore the contractions and sleep. It didn’t work and I called the midwife around 2 am and told her that things were moving. I wasn’t sure how this labor would progress as baby was still breech and still high, so it felt different than my other labors. 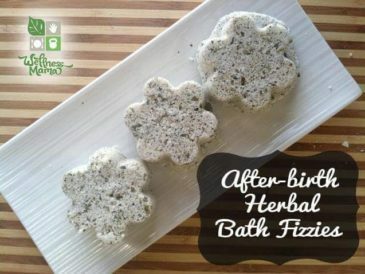 The midwife checked me and I was only 4 cm… That was mildly discouraging, but I knew that once my labors picked up they progressed quickly, so I got in to the tub and tried squatting and hands and knees positions to help baby move down. There was also some meconium that came out with the fluid, but ironically, this is not as much of a concern with a breech delivery since the bottom was pointed down and the meconium was being pushed out and not in to the fluid with the baby. After an hour or so I got bored with the tub. I’d always wanted a water birth and never expected to not want the water when I finally had a chance to try it but I also felt like I needed gravity and wanted to move around more than the tub would allow. I got out and walked, swayed and sat on the birth ball for a couple of hours to help get through contractions (which were still every 4-6 minutes at this point). At around 11 am, the midwife checked me again and I was still only 4-5 cm dilated, though she said it was because the baby was high and that I could easily stretch to a 6-7 if she were on my cervix. Due to the baby’s position, the midwife suggested that I try laying on my back with my hips elevated over a pool noodle to help open the pelvis and help her move down. I tried and contractions got much more intense immediately. I spent about 45 minutes in that position and on my side and contractions were getting really tough to cope with. She checked me and I was 7-8 cm and had reached the point where I start getting really focused and not wanting to talk or move, even between contractions. The midwife suggested I get back in to the tub or in the shower to see if that helped things. The tub still sounded horrible, so I opted for a shower and the hot water really did make the contractions more bearable. I started having the contractions that require deep moaning (at least for me… I always wish I was one of those moms who labor quietly, but c’est la vie). I moaned and swayed in the shower for close to an hour. The logical side of my brain was telling me that I was in transition, the low sounds meant she was descending, and that there was an end in sight, but my emotional side was reaching the “I can’t do this” point. I was also having an internal struggle about if I could actually do this or not and if it would be better to just transfer to a hospital (where there would be pain relief). I was having back labor, which I hadn’t experienced before, and was feeling the contractions down my legs and in my hips as well. At this point in labor, my husband is truly my rock. In early labor he is great at keeping the mood light and distracting me, but at this point, he coaches me though each contraction and really gets in my face when I start to lose control. He reminds me to breathe through each contraction and to relax in between. The midwife asked me to get out of the shower so she could check me since the sounds I was making indicated that delivery might be approaching. I don’t know how they managed to get me out of the shower at that point, but that made things even more intense and being checked HURT! I was really hoping to hear that I was at 10 cm, especially since I knew I might need to stay there without pushing for a while since she was breech and we had to make sure there was no lip on my cervix. She checked me and I was…. At this point, I almost gave up. Things were tough and had been for hours. The contractions were on top of each other and enough to make me nauseous and I hadn’t progressed AT ALL. I considered giving up but realized that (a) this wasn’t really logical at this point (b) it would take a long time to transfer, get pain relief, etc and (c) I would end up with a c-section if I did that. The midwife suggested sitting on the toilet for a few contractions. Oh, the “dilation station” as we call it in doula-speak. 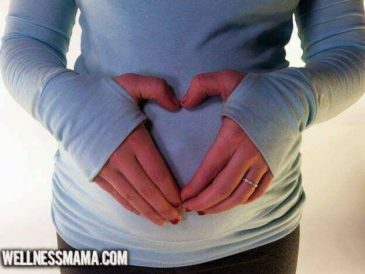 I didn’t want to because I’d encouraged clients to do this and knew that it worked but that it increased the intensity a lot (the theory is that since we are used to relaxing those muscles on the toilet, sitting there helps us do this even during labor). With the help of husband and midwife, I somehow made it to the toilet and sat down. I had a mental pep talk with myself and told myself that this was it. For baby’s sake I had to relax and let her come down and that yes, it would hurt and that it would be over faster if I could just get over being uptight. Then, in one VERY LOUD contraction, I felt myself fully dilate and felt her bottom move down. I also felt her poop and meconium drip down my leg, which was gross. The midwife checked me and sure enough, I had gone from 8-10 cm in one contraction. Finally! She checked and there was no lip left so I was cleared for pushing. They constantly monitored baby’s heart rate and she was doing great at this point. (I remember thinking that I hoped this process was a lot more comfortable for her than it was for me…). I’d always wanted to push in a semi-squatting position but the midwife wanted me either on hands and knees or with my bottom hanging off the bed so that the angle would be safest for baby. I didn’t think I could do either of these and thankfully my husband told me to get on my hands and knees and helped me do so in such a quick motion that I didn’t have a choice. The urge to push lightened up for a second in this position and then intensified again. In my head, I was having the debate I always have between “I don’t want to push… it will hurt” and “I want this baby out now.” Eventually “baby out now” won and I pushed. I instantly felt the ring of fire (cue Johnny Cash) and felt her head (er… bottom) emerge. I pushed again and felt what I thought was the rest of her body as I felt the slippery feeling that I usually feel when the body slides out after the head. 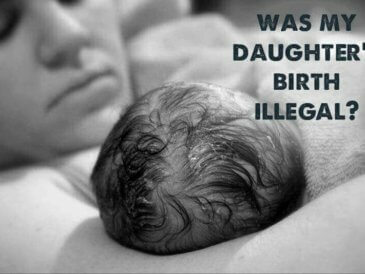 Since she was breech, she was only out to the head. I remember thinking “Crap, I have to push again.” The midwife told me she needed me to push NOW and I did…. Instantly, she slid out and that wonderful moment of sweet relief came. Almost immediately, I heard her cry and just broke down, fell on the bed and said “Oh, Praise God” over and over. She was pink, breathing and perfectly healthy with 1 and 5 minute APGARS of 9 and 10. For all of my mental complaining about it, I only pushed three times and she was out in minutes! Little Ella weighed 6 lbs 8 ounces and had a head of dark hair! All of my fear, doubt and feelings of inadequacy from previous birth experiences melted away as I looked at my perfect, healthy baby and she stared back at me. 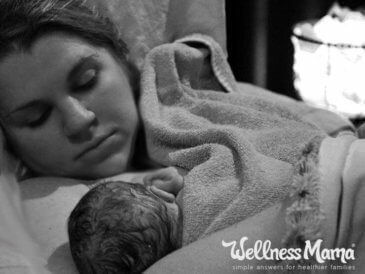 The time immediately postpartum was the most different from my previous birth experiences. I held her for an hour after she was born. The cord was allowed to stop pulsing before it was cut and I actually got to cut it! Since she wasn’t in distress, there was no rush to take her away and weigh her, clean her or put drops in her eyes. She latched on to nurse on her own at 16 minutes old and has been nursing well ever since. I got to shower, get dressed in my own clothes, nurse her in my own bed and eat my own food while she happily slept on my chest. This recovery has been by far my easiest and she has been my calmest baby. It was also my shortest natural labor (previous ones were 26 and 25 hours) at only about 15 hours of painful contractions (I think this is largely because I was more relaxed and felt more supported this time). I certainly value and respect the need for medical intervention when needed (it saved my life and my son’s when I was pregnant with him) but I also don’t think that every birth requires the interventions that are often routine. I would definitely choose home birth again, but I also hope that eventually the medical mindset will change to allow for breech birth in hospitals, as I know many women who have had multiple c-sections because a first baby was breech and v-bac is not encouraged where they live. I don’t think that home birth is for everyone or every situation, but I am so glad that I pursued it for this birth!